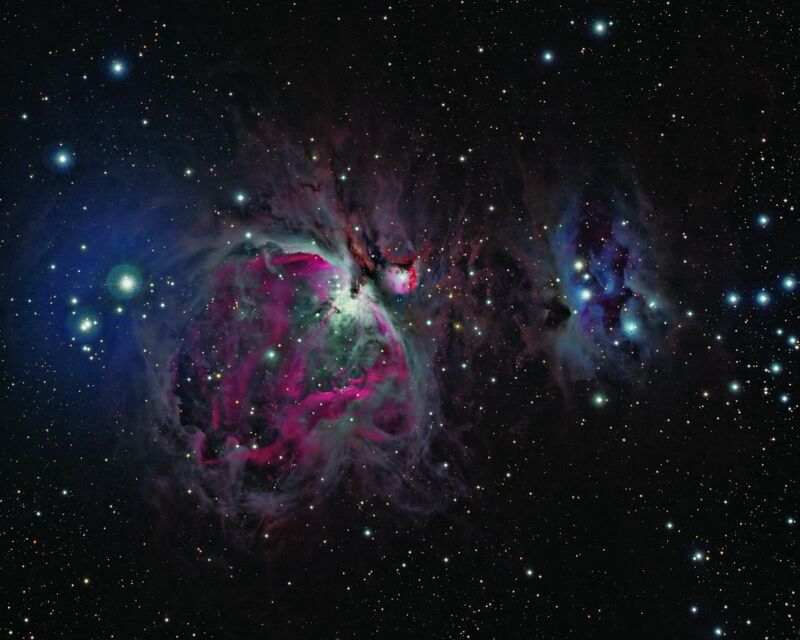 Title: M42. The Orion nebula (M42) (left), and the adjacent Running Man nebula (NGC 1973) (right) are visible to the naked eye, but a tough photographic target because they combine a very bright central core with extended diffuse nebulosity. This image is a combination of 3 RGB photographs shot at different time intervals (60, 180, and 300 seconds) and combined using the high dynamic range (HDR) feature of PixInsight software. Registration, integration, channel combination, color correction, and HDR transform were done in PixInsight and slight touch-ups in Photoshop. The images were shot with Takahashi FSQ 106 from New Mexico and Australia and the total time of acquisition was 5.2 hours.